Have you heard the haters on the hydroponics forums lately? We have. But as the iconic American hero, Paul Newman, once said, "If you don’t have enemies, you don’t have character." Here’s your chance to help set the record straight, and let the haters know what real growers, who actually know what they’re doing have to say about our products. Were you ever skeptical? Did you buy into the b.s. 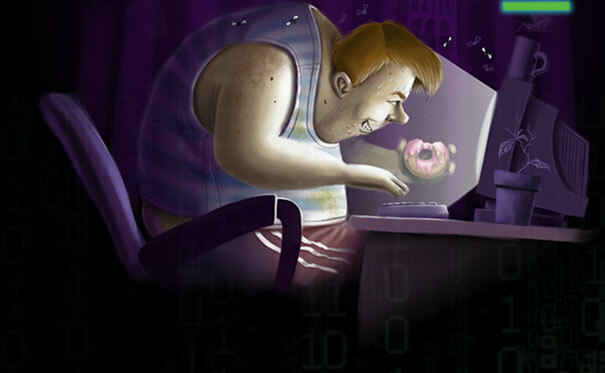 on the forums before you had success with Advanced Nutrients? If so, send us your Advanced Nutrients success story and the best one will WIN a prize package of the complete Bigger Yields Flowering System, just to say thanks for having our back! If you win, you’ll get your choice of any Base Nutrients, plus the Hobbyist, Expert, Professional and Grand Master Grower Bundles, the whole chimichanga, yours FREE! I am here to share my experience with you guys. I have used about every nutrient program on the market and while they produced results, it always seemed like there was something missing. Like I could unleash more genetic potential using products tailored to the plants I grow by REAL scientists and doctors. I purchased the entire Bigger Yields Flower System for my most recent run. I was slightly skeptical at first, mainly since I had never used so many different additives. I said to myself, “There is no way every one of these bottles is going to produce results.” I am happy to say Advanced Nutrients has proved me wrong. From the very beginning I saw explosive growth, and huge, white roots. The Voodoo Juice, Tarantula, and Piranha are an absolute winning combination, adding the agonist to the solution to keep the spores dormant until it is diluted, is pure genius, my hat is off to the scientists/doctors who developed these products. I will NEVER grow any type of plant without those additives, out of every one of Advanced Products I am by far the most impressed with these three. Some serious work went into developing this beneficial trio, and there is NO other product on the market that can compete with these three inoculates. After flowering was induced, AN’s Bud Ignitor really produced a TON of flow ering site, much more than competitors products (yes, I’m looking at you Open Sesame). Every single branch was packed full of bud sites that produced arm sized buds. Big Bud is the best mid flowering nutrient I have ever used, I have had to tie up every single one of my branches due to the immense weight on them, in my book AN has the best bloom boosters on the market. Overdrive really impressed as well, and produced a huge surge of growth the last week of flowering. This stuff really makes your buds swell up and put on weight in those last crucial weeks of flowering that most people neglect. AN has another winning combination w ith these products as well, Bud Ignitor, Big Bud, and Overdrive, and I will be using them every single run from here on out. Advanced Nutrients other flowering additives are awesome as well! B-52 is great for transplants and increased nutrient uptake, really any time one of my plants is stressed out, they get some B-52 and recover very quickly. Bud Candy is an awesome sweetener, and a must for feeding your beneficials from using Voodoo Juice, Piranha, and Tarantula. I was also impressed with Rhino Skin, w e had an extremely hot summer, much hotter than normal, and all of the garden never skipped a beat, and really toughened them up. You are going to need some bigger cutters when you cut your garden down after using Rhino Skin, the stems are so tough, it is incredible. I am completely satisfied with Advanced Nutrients, I saw an average 22% increase in yield and a much higher quality bounty. I will NEVER grow without Advanced Nutrient’s system again, they are absolutely the best nutrients you can give your girls, while knowing how much science and testing went into the development of every single one of these products. For any skeptics, or people looking at trying this nutrient system, the only thing I can tell you is to give them a try. They will surpass your expectations in every single way, and you can realize the full genetic potential of your crops. 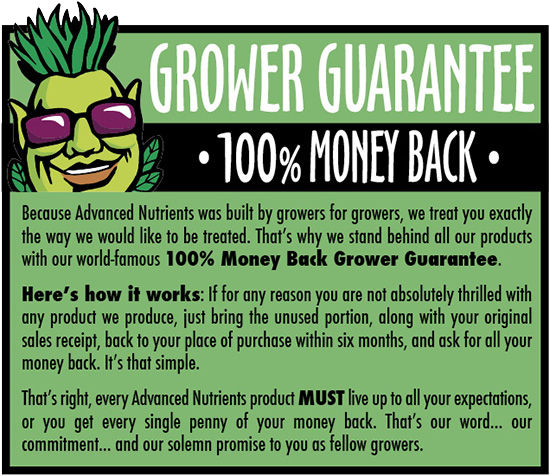 And with AN’s “Grower’s Guarantee”, you have absolutely nothing to lose. If you aren’t satisfied with their product, you can get a 100% refund. A company standing behind their product that will, really says a lot about their business and products. If you ever have any specific questions, call AN up, and someone will answer any plant specific question that you have. Top notch customer support and a top notch product. What are you waiting for? Get out there and buy this feeding system and watch your garden meet it’s full potential. You might want to add a few feet to your area as well, because these will probably be the biggest plants you ever grow . Thank you Advanced Nutrients for developing such a winning system. Keep up the great work, you have a customer for life here! When I began growing, I of course like most new growers went with a cheaper line of nutrients, with the idea in my head “nutrients is nutrients, RIGHT?” being my first time growing and actually producing a decent crop (I thought), I continued on using that product until it was all gone, then I started to do some research into what nutrients plants need at certain times of growth and that’s when I came across a company known as Advanced Nutrients. Of course seeing the price of the product at first made me think twice about if I should just go to a another company and see what they were offering. But after a few days of looking into other companies and seeing as Advanced Nutrients was making the product specifically for the types of plants I was growing I decided to shell out the money and just go for it. I decided to go with the Grow /Micro/Bloom line, Big Bud and Overdrive. When I first started using it, I of course didn’t see a huge difference in my plants (probably because I was a noob), which kind of disappointed me, but once I hit budding my plants just took off, I couldn’t believe how many buds were forming all over the plant, by the end of flowering I couldn’t of been more satisfied with the products that I had purchased. I then moved on to other products in the Advanced Nutrients line including Bud Blood, Carboload, Piranha and of course Connoisseur and to this day I continue to use Advanced Nutrients. Was using one of your main competitors line of nutrients for the longest time, after trying out a few different lines I finally stuck with them. However, I met someone that had been growing the most beautiful plants I’ve ever seen, as far as medical grade quality goes – this guy had it down. I met with him more and more to learn his secrets and tricks, it turns out he did nothing different than I did except his nutrient line - was Advanced Nutrients. As soon as I switched to Advanced Nutrients, Grand Master Level - I noticed an immediate difference in my crop. The quality was increased exponentially, the nodes in which buds grew also increased to a fantastic degree - the quality, by which I mean smell, taste and potency - was paramount. I will never go to another product again, Advanced Nutrients - you’ve saved me. Do you have a success story like the amazing ones mentioned above? We are sure you do, and we would love to hear them. Professional and Grand Master Grower Bundles - the whole chimichanga, yours FREE!